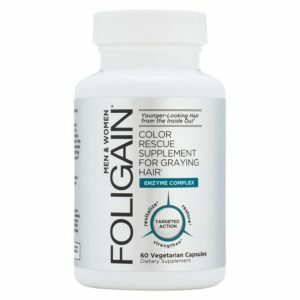 Foligain is a food supplement, manufactured by a private American company, Foligain Ltd. Foligain is designed to help restore normal hair pigmentation by reactivating near dead or dormant melanocytes (specialized cells that secrete melanin, the hair pigment) in the hair follicle and thus reduce and even reverse the process of greying. Foligain is made in a cGMP-compliant facility in the USA. The food supplement contains natural ingredients that have been approved by the FDA for human consumption. Foligain has been created on the basis that greying is caused by an accumulation of hydrogen peroxide at the hair follicle level. This toxin is a by-product of oxidative stress and is naturally produced by hair cells. Hydrogen peroxide is produced in small quantities at all ages. In young individuals, this toxin is broken down into hydrogen and oxygen with the help of the enzyme catalase; both of which are harmless. As we age, less catalase is produced, which leads to an accumulation of hydrogen peroxide in the hair follicle. This toxic build-up interferes with the hair follicle’s ability to produce pigmented hair and even strips away molecules of melanin (the hair pigment produced by hair follicles), leading to the emergence of grey hairs. 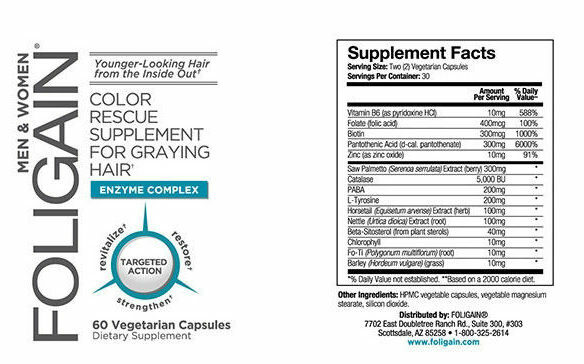 Foligain contains the enzyme catalase and thus actively fighting the onset and halting the greying process. In addition to this core ingredient, Foligain also contains numerous antioxidant vitamins, Biotin and plant extracts that fight off oxidative stress, nourish and improve the overall health of the hair. The following ingredients and amounts are per serving size of 2 capsules. Other Ingredients: Vegetable capsules, silicon dioxide, magnesium stearate. The daily recommended dose is 2 capsules; one pill to be taken in the morning and one at night time before going to bed. It is recommended to take the supplement with food. Foligain is designed to help those that wish to keep grey hairs at bay for as long as possible. Taking the supplement regularly will help individuals maintain their natural hair color longer. The effects of the treatment can vary from one individual to another, yet results can be seen approximately in 4 to 9 months after adding the supplement to the diet. The product claims that it will make hair grow thicker, healthier and pigmented. It is important to note that hair that is already grey cannot be recolored through any natural way. However, as hair begins to grow once more, it will be rejuvenated with the individual’s natural color. Those that already have a full head of grey hair will only benefit from this supplement mildly. The product has not been shown to cause any side effects. However, if you fear that ingredients might interact with your current medication or existing physical conditions, consult your physician before taking the supplement. The product does not contain any major food allergens. It is suitable for vegetarians. It is not intended for children, pregnant or nursing women. You can order the product online, directly on the company’s site. They ship to the EU and USA. The company does not offer any money-back back guarantee for this product.